paddy cultivation in India has often been associated with increasing greenhouse gas emissions. Indian scientists have now shown it is the other way round. A study says paddy sequesters organic carbon from the atmosphere thereby reducing global warming. About 5.5 tonnes per hectare of organic carbon can be added to soil through paddy cultivation, say researchers Bidisha Majumdar of Jadavpur University and Biswapati Mandal of Kalyani University, Kolkata. 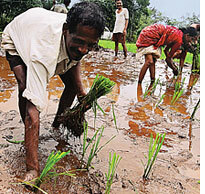 They tested soil under paddy cultivation in Orissa. Contrary to belief that more carbon is released into the atmosphere as methane, Mandal says "The amount of carbon lost from the soil as methane is lower than the amount of carbon left. Only 2.5-5 per cent of the carbon added to the soil through paddy cultivation is lost as methane." Majumdar says paddy fixes carbon in the soil because submerged conditions prevent the carbon from oxidizing and aquatic plants add 0.7 tonnes per hectare of carbon to the soil annually through photosynthesis. Mahadeshwara Swamy, India's national communication officer to the United Nations Framework Convention on Climate Change, agrees. "Ninety per cent of the methane produced in the fields is absorbed by the roots," he says. Indian scientists have repeatedly contested claims about the amount of methane emissions from rice. Atmosphere scientist A P Mitra in 1998 had said that western scientists overestimated methane emissions from rice fields in developing countries. He had pointed out the need to revise methane emission factors laid down by the Intergovernmental Panel on Climate Change in the light of studies for paddy. But none had tried to contest the rice and global warming connections from the carbon sequestration angle. While most scientists agreed with the Kolkata researchers' findings, some say more evidence is required. "We do not have sufficient studies to link carbon added to the soil with carbon dioxide in the atmosphere. There is a possibility that the carbon is temporarily locked up in the soil and in the summer when the temperatures are high they might get oxidized to carbon dioxide," says Bijay Singh, professor of Punjab Agricultural University at Ludhiana. He, however, considers the study promising. "Similar studies have started under the National Agricultural Innovation Project. The results will take two to three years," he added.